Authors, burns, poisoning, theologians, publishers, booksellers, editors, friendships, and painters. From James being thus placed first, the conclusion is drawn that John was the younger of the two brothers. In any case John had a prominent position in the Apostolic body. Peter, James, and he were the only witnesses of the raising of Jairus's daughter (Mark 5:37), of the Transfiguration (Matthew 17:1), and of the Agony in Gethsemani (Matthew 26:37). Only he and Peter were sent into the city to make the preparation for the Last Supper (Luke 22:8). 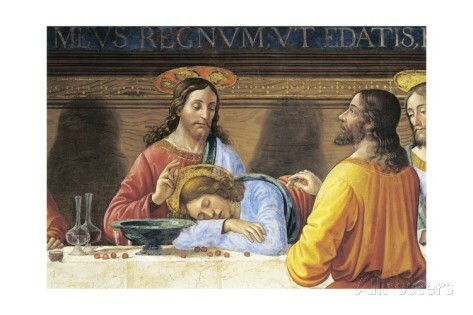 At the Supper itself his place was next to Christ on Whose breast he leaned (John 13:23, 25). According to the general interpretation John was also that "other disciple" who with Peter followed Christ after the arrest into the palace of the high-priest (John 18:15). John alone remained near his beloved Master at the foot of the Cross on Calvary with the Mother of Jesus and the pious women, and took the desolate Mother into his care as the last legacy of Christ (John 19:25-27). After the Resurrection John with Peter was the first of the disciples to hasten to the grave and he was the first to believe that Christ had truly risen (John 20:2-10). When later Christ appeared at the Lake of Genesareth John was also the first of the seven disciples present who recognized his Master standing on the shore (John 21:7). The Fourth Evangelist has shown us most clearly how close the relationship was in which he always stood to his Lord and Master by the title with which he is accustomed to indicate himself without giving his name: "the disciple whom Jesus loved". After Christ's Ascension and the Descent of the Holy Spirit, John took, together with Peter, a prominent part in the founding and guidance of the Church. We see him in the company of Peter at the healing of the lame man in the Temple (Acts 3:1 sqq.). With Peter he is also thrown into prison (Acts 4:3). Again, we find him with the prince of the Apostles visiting the newly converted in Samaria (Acts 8:14). We have no positive information concerning the duration of this activity in Palestine. Apparently John in common with the other Apostles remained some twelve years in this first field of labour, until the persecution of Herod Agrippa I led to the scattering of the Apostles through the various provinces of the Roman Empire (cf. Acts 12:1-17). Notwithstanding the opinion to the contrary of many writers, it does not appear improbable that John then went for the first time to Asia Minor and exercised his Apostolic office in various provinces there. In any case a Christian community was already in existence at Ephesus before Paul's first labours there (cf. "the brethren", Acts 18:27, in addition to Priscilla and Aquila), and it is easy to connect a sojourn of John in these provinces with the fact that the Holy Ghost did not permit the Apostle Paul on his second missionary journey to proclaim the Gospel in Asia, Mysia, and Bithynia (Acts 16:6 sq.). There is just as little against such an acceptation in the later account in Acts of St. Paul's third missionary journey. But in any case such a sojourn by John in Asia in this first period was neither long nor uninterrupted. He returned with the other disciples to Jerusalem for the Apostolic Council (about A.D. 51). St. Paul in opposing his enemies in Galatia names John explicitly along with Peter and James the Less as a "pillar of the Church", and refers to the recognition which his Apostolic preaching of a Gospel free from the law received from these three, the most prominent men of the old Mother-Church at Jerusalem (Galatians 2:9). When Paul came again to Jerusalem after the second and after the third journey (Acts 18:22; 21:17 sq.) he seems no longer to have met John there. Some wish to draw the conclusion from this that John left Palestine between the years 52 and 55. Both the Epistles and the Apocalypse, however, presuppose that their author John belonged to the multitude of personal eyewitnesses of the life and work of Christ (cf. especially 1 John 1:1-5; 4:14), that he had lived for a long time in Asia Minor, was thoroughly acquainted with the conditions existing in the various Christian communities there, and that he had a position of authority recognized by all Christian communities as leader of this part of the Church. Moreover, the Apocalypse tells us that its author was on the island of Patmos "for the word of God and for the testimony of Jesus", when he was honoured with the heavenly Revelation contained in the Apocalypse (Revelation 1:9).